TUR’s comprehensive and successfully used isokinetic system. A complete set of work adapter simulators has been developed, expanding functional possibilities. 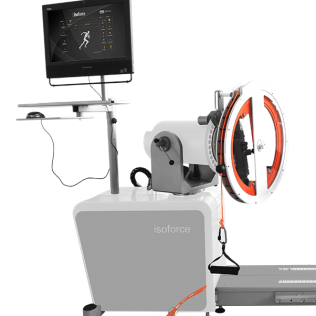 Furthermore, closed kinetic chain for upper and lower limbs, as well as an easy to set up flywheel with pulley function enhance isoforce’s exercise patterns and make the system one of the most powerful rehabilitation tools. The system itself received a new industrial design, requiring less space while the utilization of -state of the art- micro processing has further increased the precision of isoforce.